Well we took the kids out to the Starry Plow on halloween as usual for the kids halloween pizza party - and there he was, Xenu the galactic overlord himself, up against the bar obviously a bit worse for wear and decidedly half cut, he'd had more that a few. Once the kids had got their pizza and were running around showing off their costumes I grabbed a pitcher of beer and sat down besides the poor guy ... in person he's actually quite nice, but at the time he was pretty down in the dumps - seems it's no fun being a galactic tyrant on Halloween - everyone just thinks you're a guy in a silly suit. So how do you cheer up a drunk intergalactic bad guy? Well we found a way ... we took him trick-or-treating. He was great ... little kids these days have forgotten the "trick" part of the trick-or-treat game .... we had a blast - although I do think that that trick of turning your whole body inside out on someone's doorstep was taking it a bit far, and maybe gave the game away. 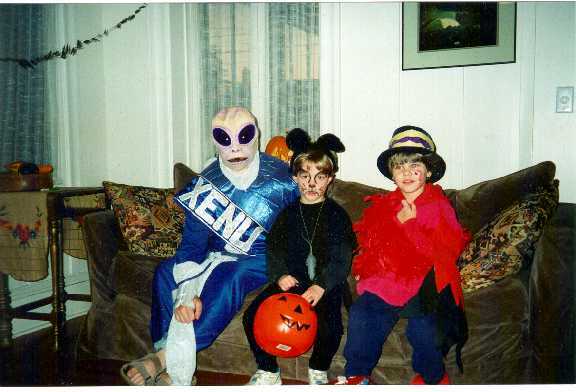 In the process Xenu both cheered up and sobered up and we took him back home to help us all devour the mountains of candy people had been throwing at us all night (mostly to make us go away). I knew no one would believe me so I took photos. Yup there he is right on my couch! I can't wait for next year, Xenu said he'd stop by next year later on in his world tour - he told us about these people in San Francisco at an "org" or something, he said he'd been playing with their minds for years and they were ripe for serious halloween fun - so join us, bring the kids, we're going to have a blast.